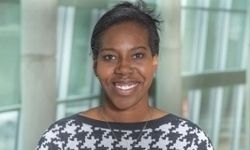 UNMC › Pathology and Microbiology › Faculty › Bios › Leah Cook, Ph.D.
My lab’s research is focused on investigation of cellular interactions within the tumor bone microenvironment that contribute to tumor progression, with a specific focus on immune cell-tumor interactions. Within bone, metastatic cancer cells highjack the normal couple process of bone remodeling, resulting in excess bone degradation and subsequent release of growth factors that promote tumor growth. Additionally, cancer cells progress and mediate bone turnover through molecular and cellular interactions with the surrounding bone stroma. My lab is currently focusing on identifying the importance of neutrophils and/or granulocytic MDSCs in prostate cancer progression and cancer-induced bone disease using a combination of transcriptome and proteomic profiling of patient samples and mouse in vivo models of bone metastasis. My goal is to identify novel immunotherapeutic targets for treating and curing bone metastatic cancers. Cook LM, Araujo A, Pow-Sang J, Budzevich M, Basanta D, Lynch CC. Predictive computational modeling to define effective treatment strategies for bone metastatic prostate cancer. Sci. Reports. 2016. 6:29384. Cook LM and Lynch CC. Targeting Bone Metastatic Castrate-Resistant Prostate Cancer. Am J Hematology and Oncology. In press, August 2016. Araujo A, Cook LM (co-first author), Lynch CC, Basanta D. An integrated Computational Model of the Bone Microenvironment in Bone-Metastatic Prostate Cancer. Cancer Research, 2014. 74(9): 2391. Gallaher J, Cook LM, Gupta S, Araujo A, Dhillon J, Park JY, Scott JG, Pow-Sang J, Basanta D, Lynch CC. Improving treatment strategies for patients with metastatic castrate resistant prostate cancer through personalized computational modeling. Clin Exp Metastasis. 2014. 31(8):991. Cook LM, Shay G, Aruajo A, and Lynch CC. Integrating new discoveries into the “vicious cycle” paradigm of prostate to bone metastasis. Cancer Metastasis Reviews. 2014. 33(4):1125. Cook LM. Mesenchymal stem cells: the truth about their nature, origin and potential use for therapy. Research Highlight. Journal of Postdoctoral Research. 2013. 1(9): 25. Cook LM, Cao X, Debies MT, Dowell AE, Edmonds MD, Beck B, Kesterson RA, Desmond RA, Frost AR, Hurst DR, Welch DR. Ubiquitous Brms1 Expression is Critical for mammary carcinoma metastasis suppression via promotion of apoptosis. Clin Exp Metastasis. 2012. 29:315. Cook LM, Hurst DR, Welch DR. Metastasis suppressors and the tumor microenvironment. Semin Cancer Biol. 2010. 21:113. Bodenstine TM, Vaidya KS, Ismail A, Beck BH, Cook LM, Diers AR, Landar A, Welch DR. Homotypic gap junctional communication associated with metastasis suppression increases with PKA activity and is unaffected by PI3K inhibition. Cancer Res. 2010. 70:10002. Yuan K, Frolova N, Xie Y, Wang D, Cook LM, Kwon YJ, Steg AD, Serra R, Frost AR. Primary Cilia Are Decreased in Breast Cancer: Analysis of a Collection of Human Breast Cancer Cell Lines and Tissues. Journal Histochem Cytochem.2010. 58: 857. Harper CE, Cook LM, Patel BB, Wang J, Eltoum IA, Arabshahi A, Shirai T, Lamartiniere CA. Genistein and resveratrol, alone and in combination, suppress prostate cancer in SV-40 tag rats. Prostate. 2009. 69:1668. Harper CE, Patel BB, Cook LM, Wang J, Shirai T, Eltoum IA, Lamartiniere CA. Characterization of SV-40 Tag rats as a model to study prostate cancer. BMC Cancer. 2009. 9:30. Timothy G. Whitsett Jr.1, Leah M. Cook1, Brijesh B. Patel1, Curt E. Harper1, Jun Wang and Coral A. Lamartiniere1,2 . Mammary and Prostate Cancer Chemoprevention and Mechanisms of Action of Resveratrol and Genistein in Rodent Models. Bioactive Compounds and Cancer. Nutrition and Health. 2010, Part 4. 589-611.